The early Pleistocene fossil site of Dmanisi is justly famous for the abundance of hominid remains, but it is also very rich in fossils of the sabertooth cat Megantereon. Taphonomic studies suggest that the fossil site area corresponds to what was a small peninsula in the margin of a lake during the Pleistocene, making it a good place for predators to ambush their prey. Megantereon would often kill here, and hominids soon learned that there would regularly be carcasses to steal. A solitary, medium sized cat, Megantereon would normally retreat from an aggresive, organized band of hominids, leaving its kill behind. How do we know this episode ever took place? Well, the fact is that one of the hominid skulls from Dmanisi, labelled as D2280, happens to have two punctures in the occipital area that correspond with amazing precision with the size and separation of the tips of Megantereon‘s upper canines. Too oval in shape to be the marks of a jaguar’s conical fangs, and too small and close together to correspond to the larger sabertooth Homotherium (both felids also lived in the area), these punctures are very reasonable evidence that Megantereon did attack this hominid. 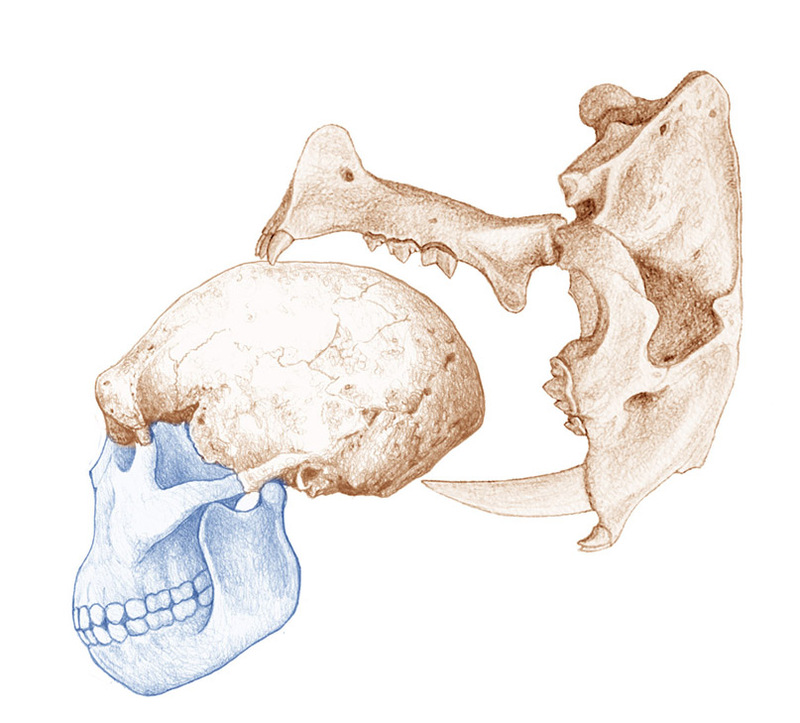 And even if the wound may not have been deadly, the fact that the hominid skull was found at the site suggests that it died shortly after the encounter (from this or other wounds), beacause the Damnisi fossils hardly suffered any post-mortem transport and correspond to creatures that died right there in the area. 1.- As seen in the schematic drawing below, the punctures could only be produced with the cat biting from the front and top of the head, thus forcing the cat to open its jaws in an angle well over 90 degrees. I spent some time manipulating the casts of the hominid and felid fossils from Dmanisi and there was no other possible way to position both skulls that would result in such wounds. We already knew from the anatomy of Megantereon that it was capable of such phenomenal gape, but this is striking evidence of it happening. 2.- The absence of visible puncture wounds in the frontal area of the skull where the lower canines would have hit the bone (see the drawing below) strongly suggests that the upper canines were striking with much greater force. This fits wonderfully with the “Canine Shear-Bite” hypothesis, where the intial penetration of the sabers into the body of prey is driven by a downward pull powered by the anterior neck muscles, rather than by the jaw closing musculature. A conventional bite powered by jaw-closing muscles would result in more forceful pull of the lower canines and, in this case, would likely cause additional punctures in the skull. 3.- The very presence of these punctures seems to contradict the hypothesis that sabertooths were extra-careful not to hit bone when biting at their prey, and suggests unusual behaviour. But this example does add to a series of cases from the fossil record where there are unmistakable puncture marks caused by sabers in the bones of other animals. Can you guess what is it that most of these examples have in common? Well, in most of those cases it is the bones of other predators, not prey, that bear the mark of the saber. Coincidence? Not likely. But then there are examples of different situations also… To learn more, look for the book “Sabertooth” in October! An now, a VERY rough sketch made as I tried to figure out how the actual attack may have happened. That surely hurted! Posted on 19/06/2013, in Uncategorized. Bookmark the permalink. 7 Comments. I can’t wait for your new book! I have learned more about my life-long passion (sabertooth cats) from your work than from all other sources combined! Thank you so much Sheila. I have tried to put together a decent introduction to sabertooth lore in this book, an I sincerely hope you will enjoy it! Anyway, there is a lot of stuff that was inevitably left out for lack of space and time, but that stuff will find its way to future projects! This is interesting but I have a quick question if it’s all right with you? Generally with Saber-tooths they would avoid biting bone because it would risk breaking their teeth. So if that’s the case, wouldn’t biting that part of the skull damage the sabers? Anyway I’m looking forward to reading the book when it comes out, keep up the work! Hello Brock, you are absolutely right to point that biting a hominid skull like that could damage the sabers, and for that reason a sabertooth would normally avoid doing something like that. But, as I point in the text of the post, it is possible that sabertooths would behave less cautiously about their sabers when they were dealing with competition rather than with prey. There are several examples in the fossil record of bones of animals that bear the mark of a piercing sabertooth canine, and in most of those cases it is the bones of other predators, not prey, that have been pierced. That would be one killer toothache after the attack was finished. Is there any way to determine if the bite marks indeed resulted from the attack itself, as you suggest in your sketch, or perhaps from the cat grabbing onto its recently deceased prey (lying face-down at this point) by the back of the head and dragging it somewhere comfy to eat? Thanks!